For the occasion of Desio Lenses’ launch of their new Coffee Collection, guests attended an exclusive coffee morning & presentation, at Culinary Boutique in Dubai. In a stylish caf� setting, surrounded by fresh spring blooms, caffeine color-coded d�cor, the invitees were invited to discover the showcased latest contact lenses collection, inspired by black coffee, cherry coffee, cappuccino, and espresso. The attendees were introduced to the Italian brands, their contact lenses creations and their latest styles. 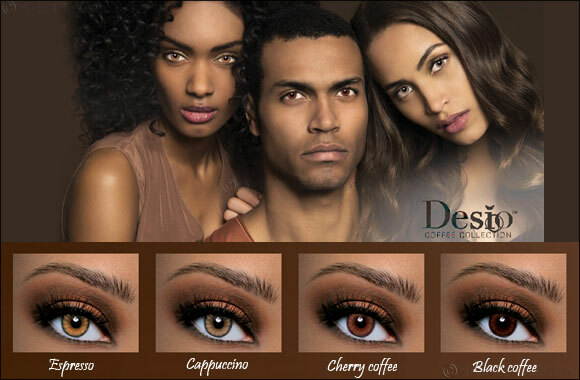 Desio Lenses presents a new range of colored contact lenses, four shades for him and her, that evoke stories of distant and exotic lands. Nuances of the Coffee Collection give the eye a natural sensuality that manifests itself through bold and refined shades. Delicate hints of cream distilled in hazel, it is the quintessential coffee and the embodiment of wakefulness. This is expressed through its intense and robust flavor of the most precious moments, like the rush from a stolen glance or feelings of strong emotion and intoxication. A splendid infusion of creamy milk foam with warm brown tones, where opposites of light and dark swirl in perfect harmony. This affinity conjures a soft and mellow aftertaste, like a caress to your skin. In the lands bordering the Red Sea were born glossy and fleshy fruits, like cherries, that contain precious grains. Their powerful amaranth hue tones give warmth and depth to the eye in a daring and provocative blend that involves all five senses. Dark as night, hot as hell. Black gold tickles the head and the heart, a bittersweet elixir for the lips to feast on. It carries the excitement of a mystery meeting, wrapped in a look full of promises that releases euphoric sensations. Desio Lenses are exclusively available at GRAND OPTICS in the Middle East.